Since the Academy was formed almost 20 years ago, we have supported the careers of clinical academics; doctors who divide their time between clinical practice and research. 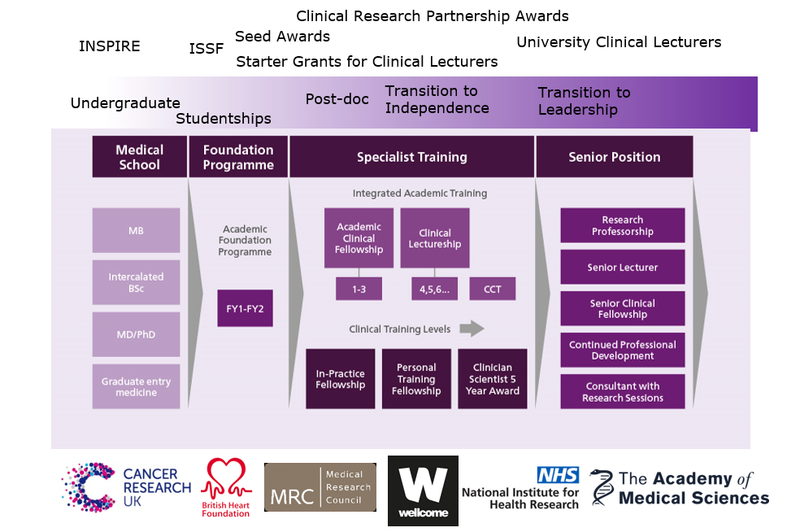 This blog post from Professor Paul Stewart FMedSci aims to highlight some of the key milestones that have shaped the current training pathway, in addition to raising some challenges for the future. More information on academic training pathways for both clinicians and biomedical researchers can be found in our recent report, 'Developing the next generation of biomedical talent: a snapshot of UK support for early career researchers', produced at the request of the US National Academy of Sciences. A little over ten years ago, clinical academic training was suffering from an absence of structure with a balance of research and clinical practice undertaken in individual, and often idiosyncratic training pathways. This inadequate system was further complicated by an increase in regulation. This obvious need for structured training, as highlighted in the Walport report, was met with the formation of the National Institute for Health Research (NIHR) and their Integrated Academic Training pathway that has since become a central pillar to all academic trainees. Crucial to its success, the training pathway was met with buy-in from the major funders in the form of complementary funding schemes that now make up this robust pipeline of funding opportunities (see below). The value of clinical research can often be overlooked by medical students who have their eye on their final career position and may have very limited or no exposure to the benefit of research environments. In an attempt to change this, the INSPIRE scheme offers small grants of up to £10,000 to medical, dental and veterinary schools to run bespoke activities to inspire the next generation of clinical academics. Delivered for an impressive 15 years, with over 800 mentor-mentee pairs matched, the Academy links early career researchers with an Academy Fellow or senior academic to provide extra support and advice at critical points in their careers. Read our blog post to learn more. Clinical lectureships provide a salary and the time to conduct research but often no budget to cover the direct research costs: reagents, equipment time, research facility costs, and general consumables. To support recently appointed clinical lecturers to get off to the best start in this new chapter of their career, the Academy has been offering starter grants for clinical lecturers since 2008. Providing £30,000 over one or two years, this grant provides valuable funding to generate preliminary data to strengthen future funding applications. The incremental value of this scheme has been demonstrated by our grant holders whereby the £12 million awarded in started grants has generated an impressive £81 million in follow-on funding. It is easy to overlook the policy work that underpins so many of the programmes and grant schemes integral to clinical research. However, many key changes have occurred over the past decade; here is a snapshot of some reports that have helped to shape the training pathway. Chaired by Sir David Greenaway, this report outlines a flexible model of training serving to equip all doctors with broad based knowledge, in addition to encouraging flexibility across careers. Whether enabling doctors to dip in and out of research across all stages of training, or offering mobility between specialities, the report outlines recommendations to better equip the workforce with the skills to treat our increasingly multi-morbid population. A key response to this report was the UK Clinical Academic Training in Medicine and Dentistry: Principles and Obligations document. Launched in January 2017, this outlines obligations for funders, UK institutions and trainees to maximise the support for clinical academic careers. These principles and obligations have been signed up to by: The Academy of Medical Sciences, The British Heart Foundation, Cancer Research UK, Conference of Postgraduate Medical Deans of the United Kingdom, Integrated Academic Training Advisory Committee, Medical Schools Council, Medical Research Council, Health Education England, National Institute for Health Research and The Royal College of Physicians. In celebration of 10 years of NIHR, the report offers a comprehensive one-stop-shop to gain a more detailed insight into both the developments in clinical academic training, and the distribution of funding across different career stages and disciplines. The recently launched NIHR Academy aims to simplify and streamline NIHR academic training and personal awards and is aligned to strategic priority areas of the Department of Health and Social Care. To intelligently target specific areas of need, and to help track the success of existing schemes, a UK-wide survey of personal health research fellowships was conducted in 2017 and results compared to the 2009 survey conducted by the Office for Strategic Coordination of Health Research (OSCHR). This was analysed with Annual Clinical Academic staffing data compiled by UK Medical Schools under the auspices of Medical Schools Council. The findings were significant highlighting on the one hand the positive impact of the IAT pathway, but also identifying areas for improvement. The existing clinical academic population is ageing with an insufficient pipeline to replace them. Not all specialties are equally affected and the impact that this will have on more vulnerable specialities in particular is worrying. Although an even gender balance has been achieved through medical school and up to PhD, women often leave research before attaining more senior positions. This has resulted in top positions being very male dominated and an unacceptable loss of many talented female researchers. 6% of all doctors are currently clinical academics. However the overall clinical academic workforce is diminishing year by year, with a 2.1% decline since 2014 contrasted to a 20.6% increase in hospital consultants. Whilst the remaining challenges cannot be solved overnight, it is important to remember and celebrate the progress that has been made in recent years, and the network of stakeholders that made this possible. 2018 has seen the formation of a single high level 4-nation pan UK group, the Clinical Academic Training Forum (CATF) who have taken a solutions based approach to key challenges. Priorities for 2018 have included enhancing the diversity of clinical academics, and the collection and sharing of contemporary trainee data between funders. For more information on the Academy’s career support programme, please visit the Careers section of our website, or follow us on Twitter at @AMS_Careers.